On this week’s podcast, Michael Herb discusses his book, The Wages of Oil: Parliaments and Economic Development in Kuwait and the UAE, on this week’s POMEPS Conversations. 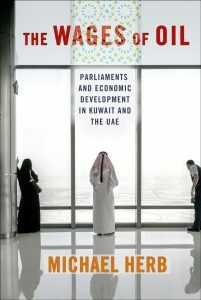 In this book, Herb provides a robust framework for thinking about the future of the Gulf monarchies. The Gulf has seen enormous changes in recent years, and more are to come. Herb explains the nature of the changes we are likely to see in the future. Oil matters. It isn’t a question of whether or not there’s an effective oil or not an effective oil. The question is, what are the causal pathways through which oil affects politics and are those causal pathways similar across different countries? You still get some very different outcomes in terms of big questions, like how powerful is the parliament and in what direction is the economy developing? And those are because oil has a profound effect. But it interacts with variables that exist in the situation, and those interactions produce results that are really quite different. Michael Herb is Chair and Professor of the Political Science department at Georgia State University. He is the author of All in the Family: Absolutism, Revolution, and Democracy in the Middle Eastern Monarchies.